Hand Held Lamps. A robust professional lighting range featuring an adjustable focus system. Zero-in on small targets with precision clarity or progressively flood broad areas with brilliant light merely by rotation of the reflector housing. . Made.. Remote handles may be mounted on a roof bar or through the roof of your vehicle, allowing a light to be operated from within. 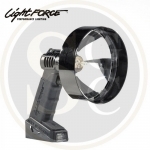 fixed power Features 360º Rotation Control the direction of your light from your s..
Lightforce Enforcer LED 140mm Handheld Cordless Lamp The new Enforcer 140mm LED handheld introduces Fresnel technology to the sporting market. The specially designed lens produces a superior tight beam for maximum light output and performance. 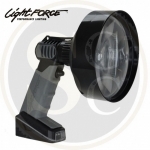 The..
Lightforce T Bar Remote Control Handle 150mm ..
Lightforce Enforcer 170 100W Handheld Light. 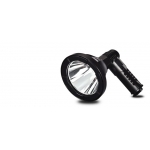 A revolutionary new handheld search light from Lightforce, the Enforcer Halogen is built tough to suit all environments while offering the power of high quality performance lighting to all users. Fe..
Lightforce T Bar Remote Control Handle 225mm Lightforce Remote Mounting Handle/Remote Control The RC225 Remote controls are designed for mounting SL or RM model lights through/one the roof of vehicles. They provide user c.. 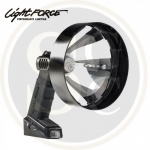 Details The Lightforce Spotlight 170 Striker features a lightweight composite polymer construction for extreme strength and durability without the heavy weight associated in metal lights. 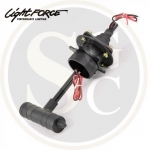 With an internal 35w ballast enclosed within the base m..
Lightforce vehicle lamping kit 150 remote handle 170 remote light .. Style: 56010014024 Size: One size Main material: 100% Polyester Product details: • 2 x rechargeable lithium batteries (18650), not included • Direct charging • 12v charger • 220V charger • T6 LED – high ..
Lightforce Enforcer 140 75W Handheld Light. A revolutionary new handheld search light from Lightforce, the Enforcer Halogen is built tough to suit all environments while offering the power of high quality performance lighting to all users. Featuri..
Lightforce vehicle lamping kit with roof bar Lightforce 150 handle lightforce 170 remote light lightforce roof bar ..
Clear Repalcement reflector Bezels - Sealed and Weatherproof .. Details Lightforce Enforcer 170 100W Handheld Light. 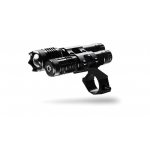 A revolutionary new handheld search light from Lightforce, the Enforcer Halogen is built tough to suit all environments while offering the power of high quality performance lighting to all u..
Green Laser Kit Remote stock switch for tactical operation. Features a high performance 5mW laser. Precision engineered from a high grade aluminium. .. 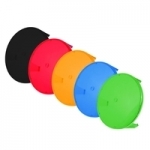 Snap fit design holds the filter in place on the lamp head rim Colours: Red: Most popular for foxing and lamping rabbits. Amber: Also good for foxing, excellent in foggy conditions Blue: For highlighting contrast..
Lightforce Handheld 170mm Striker Sporting Light is a made of a light-weight, hi-tech engineering polymer for extreme strength and durability. 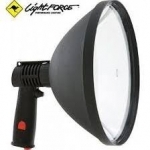 The Lightforce Hand Held 170 Striker Spotlight has a beautifully designed parabolic reflector for maximi.. 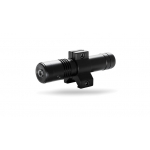 Product Overview Two remote stock switch for tactical operation. 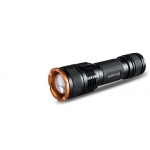 Features a high performance LED and 5mW laser. Precision engineered from a high grade aluminium. 55yd/50m LED ..
Tracer® have developed a unique torch, The Ledray F600 Focusable Quad colour LED light enables the user to rapidly switch between 4 LED colour choices. 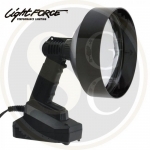 A registered design mounting system, has been invented to allow precise targeting when changin..
Lightforce custom 170mm 70W Hand Held Xenon HID Spotlight that are the next generation in lighting performance, giving 30% better light output, cleaner whiter light, and 60% reduced power consumption compared to equivalent halogen lights. Internat..
Dual Colour LED Sport Light Rechargeable Tracer Sport LED White/Red Dual Colour Handheld Rechargeable Cordless Key Features • Dual-Colour LED | 300m beam | 500 lumens. 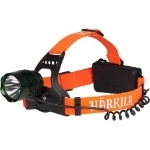 • Runtime: 2 hours..
Works brilliantly with your digital Night Vision device LED Infra-Red Illuminator with High Performance LED & Reflector setup . 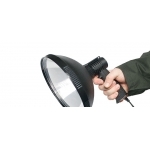 Key Features: World class super bright IR LED Adjustable Beam (spot to flood) High / Med.. 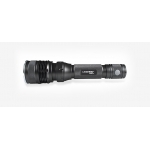 The Lightforce Handheld 240mm Blitz Sporting Light is a made of a light-weight, hi-tech engineering polymer for extreme strength and durability. 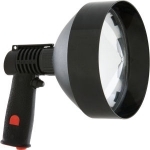 This spot light is everything you need and more to have fun outside. The Lightforce Hand Held 240 Blit..
deben Tracer LEDRay 200 Small, lightweight and incredibly robust. Use as a gunlight or hand held torch. LED's do not burn out or fail like conventional torch bulbs and are far less vulnerable to impact damage. ..
Works brilliantly with your digital Night Vision device LED Infra-Red Illuminator with High Performance LED & Reflector setup . 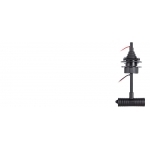 Super Bright IR LED This high performance LED combined with sophisticated circuitry is capable of produ.. The spotlight is made from lightweight composite materials, making it extremely strong, durable and lighter than conventional metal lights. 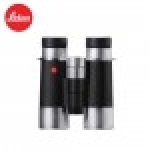 The total weight of the 240mm HID spotlight, including the 3.6-metre coil cord fitted with a cigarette plug..
Leica Ultravid 10x42 Silverline Binocular .. 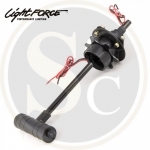 The Lightforce Spotlight 170 Striker features a lightweight composite polymer construction for extreme strength and durability without the heavy weight associated in metal lights. 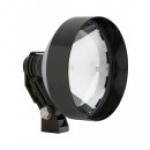 With an internal 35w ballast enclosed within the base makes this li..
A robust professional lighting range featuring an adjustable focus system. 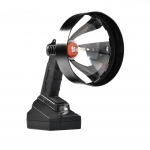 Zero-in on small targets with precision clarity or progressively flood broad areas with brilliant light merely by rotation of the reflector housing. Made from lightweight, .. 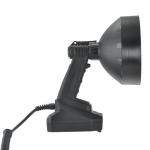 Supplied with Cigarette Plug - 5000K Bulb Lightforce custom 240mm 70W Hand Held Xenon HID Spotlight that are the next generation in lighting performance, giving 30% better light output, cleaner whiter light, and 60% reduced power consumption compa..